With development of a Sam Raimi helmed Spider-Man 4 stalling, Sony Pictures were not prepared to let their biggest multi-billion dollar film series slide into obscurity and ultimately served up franchise reboot The Amazing Spider-Man to audiences in time for ol’ web-head’s 50th anniversary. Director Marc Webb’s 2012 blockbuster proved divisive amongst fans still attached to Sam Raimi’s interpretation of the Spider-Man universe but still proved a significant financial hit for studio Sony and an exciting cinematic reinvention for one of pop culture’s most-loved icons. The Amazing Spider-Man presented an intriguing new twist on the familiar and endlessly dissected origin of Marvel’s wall-crawler, leaving film goers and fans hungry for more. Webb (500 Days of Summer) returns for this ambitious sequel that verges on convolution yet manages to hold itself together as it shifts between emotional character drama and some (literally) electrifying rollercoaster action. The Amazing Spider-Man 2 increases the stakes for Peter Parker (Garfield) as he contemplates the effects and consequences of being Spider-Man on his personal life, not in the least his relationship with Gwen Stacy (Stone). 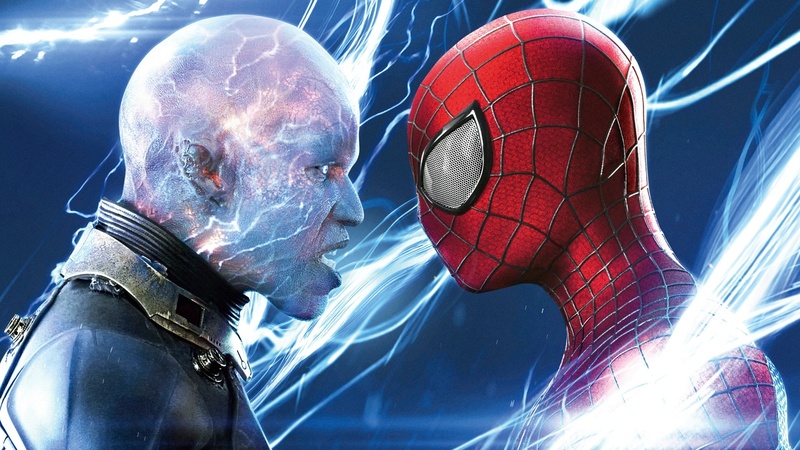 It’s the focus on this relationship that provides the thrust of the story’s satisfying emotional core and keeps its course relatively steady amongst the tangle of the numerous other story and character arcs thrown at the audience as we’re introduced to new villain Electro (Foxx), Peter’s childhood friend Harry Osborn (Chronicle star DeHaan) and thug Aleksei Sytsevich (a criminally under-utilised Paul Giamatii). With an overload of characters and secondary storylines vying for attention, The Amazing Spider-Man 2 does suffer from the same creative flaws as Raimi’s Spider-Man 3 – principally, there’s just too much going on and it does at times feel fit to burst at the seams. Foxx is fun as the geeky loner and DeHaan unnerving as the dark and brooding heir to the Oscorp corporation, providing a neat counter-balance of villainy – both are superb and take all that they can from the material. Yet the pull in all of the different narrative directions at times leaves a feeling of anti-climax, although time is taken to try and let all of the various plot elements sufficient development it does result in some slightly sluggish pacing between the pulse-pounding action beats. All the above considered, Webb is more than competent in handling the disparate features of a gripping comic book blockbuster with heart and is validated by strong actor performances not in the least from Garfield and Stone (sharing great chemistry) and even if the film’s threats do lack a little focus (there’s definitely a sense that the studio are setting up their wider Spider-Man cinematic universe) it’s Peter and Gwen’s journey in this film that stands out and the writers have certainly done justice to the characters and to an enduring icon. The bottom line: It may not quite be the amazing sequel hoped for yet despite its flaws, The Amazing Spider-Man 2 is still a thoroughly entertaining ride bolstered by strong cast performances and electrifying visuals. The Amazing Spider-Man 2 is in cinemas across the UK and Europe now and is released in theatres in the U.S. on 2nd May. What are your thoughts on The Amazing Spider-Man 2? Leave your spoiler-free comments below! Spider-Man faces an electrifying threat in Sony’s ‘The Amazing Spider-Man 2’.